I don't know if most of you get this, but I've been impressed with the recent group of emails from the USGBC titled "USGBC Update". The most recent email (pictured below) actually provided some practical info regarding changes to LEED including the fact that LEED-EB 2.0 registrations end Thursday and a clarification that residential projects 1-3 stories in height must use LEED-Homes and not LEED-NC. You can sign up for these updates for free if you do not get them already, but you must be registered with www.usgbc.org to do so. Registration for this and other emails can be done here. 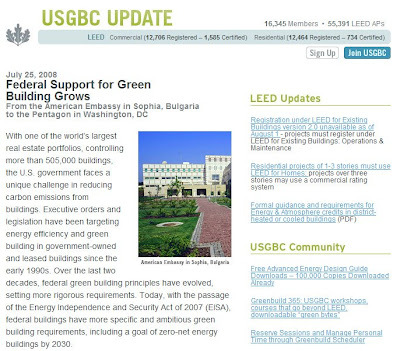 What would be even better is an RSS feed of USGBC updates on LEED specifically, but I'm not aware of any such resource. If I'm wrong please let me know by leaving a comment.